Survival may be the word of the week for the Buffalo Sabres. Survival in the sense of team health and survival on the ice. Buffalo continues a rather lengthy road trip tonight in Detroit and will have numerous trying road dates throughout this week. 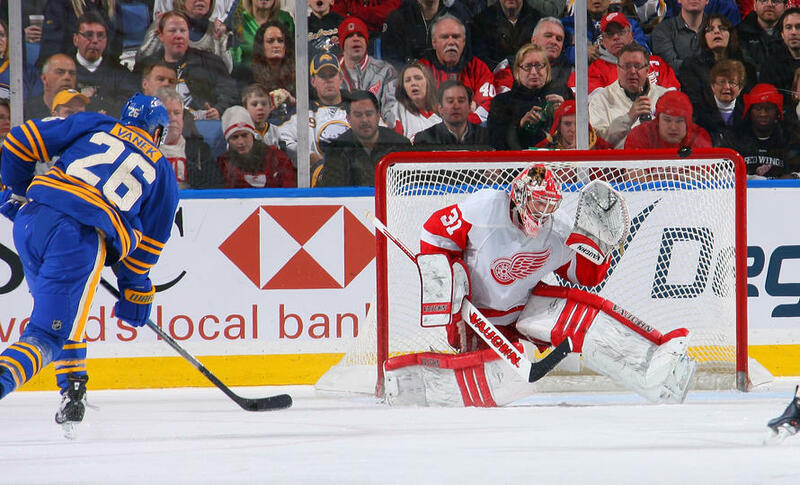 In addition to facing the Wings, the Sabres will be in Chicago, St. Louis and Winnipeg. 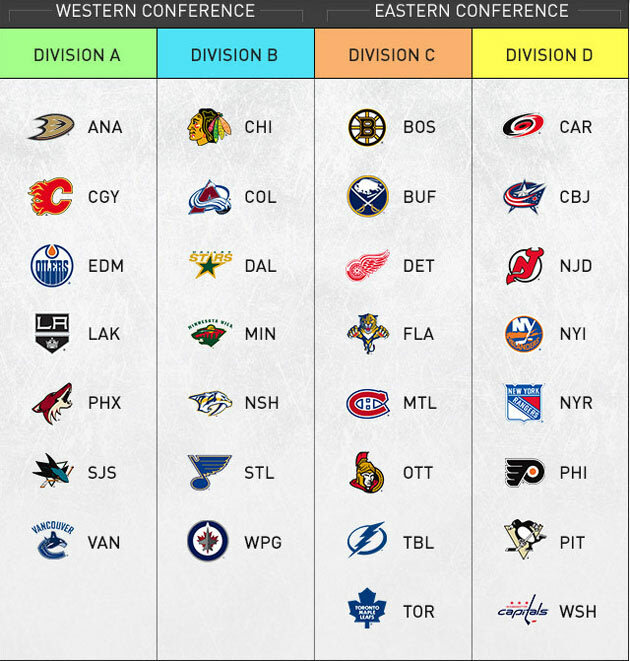 They close the trip with the Devils and Canadiens. Not exactly the schedule a struggling team would want to see. The Sabres played pretty strong hockey when they beat Toronto on Friday night. However, on Saturday, they reverted to the form which has dominated for much of the season. Another missed opportunity at building a winning streak was lost and tonight doesn’t necessarily offer a lay-up either. 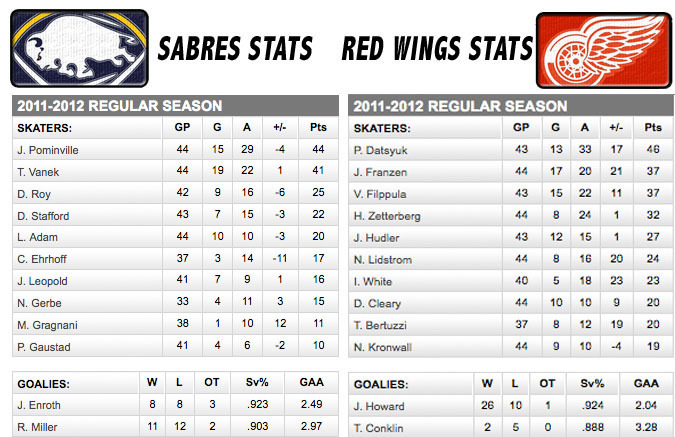 The Red Wings dominated the Sabres earlier this season. It would appear that same result could occur tonight. Buffalo’s defense is wearing thin and lack their top defenders as they prepare to face one of the most dangerous offenses in the NHL. Two points will be a tough chore for the Sabres, but it would give them four in their last three games. At some point the Sabres need to find a foundation for a run at the playoffs. This road trip might do the trick. Buffalo defense. When Mike Weber and MAG are looking at top-four minutes, there is a problem. Without Brayden McNabb and Robyn Regehr, the Sabres are forced to dig into the Rochester honey pot once again. Andrej Sekera is expected to play with Joe Finley as the scratch. Still, Tyler Myers and Jordan Leopold will get the big minutes for Buffalo while Weber, MAG, Sekera and T.J. Brennan round out the six defensemen. This group will need plenty of help this evening against a dangerous hockey club. The Detroit Red Wings strolled into First Niagara Center and showed the Buffalo Sabres where they stood in every facet of the game. By the end of the game it seemed pretty clear that the Sabres are a long way from being in the same class as the Wings – at least after yesterday’s effort. Buffalo fell behind 3-0 after 15 minutes of play and didn’t break Jimmy Howard’s shutout until the final seven minutes of the game. Once again, the Sabres only managed to score one goal, the third such occurrence in their last five games. The primary culprit to the Sabres woes were giveaways. Buffalo tries to pride itself on being a puck possession team, as do the Wings. The Wings were the only puck possession team last night. Detroit controlled the play leading to their first goal, their power play deposited their second and a brutal giveaway by Jochen Hecht led to the third. Even the empty net goal was caused by a sloppy play in the offensive zone. Hecht was the lone goal scorer for the second-straight game. He roofed a two-on-one chance that capped a pretty nice passing play between Ville Leino, Jason Pominville and Hecht. There wasn’t too much offense beyond that play. 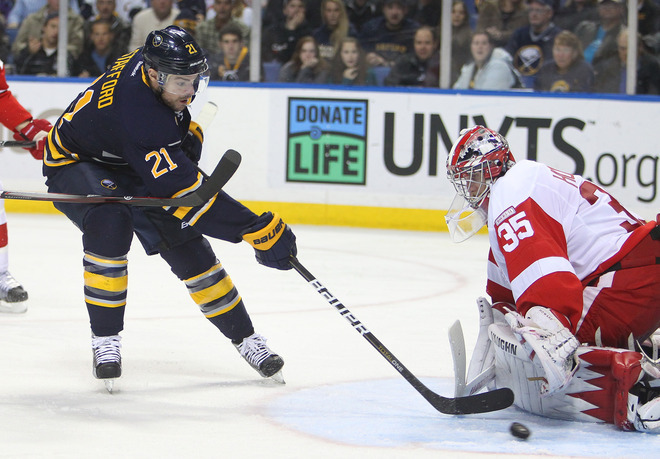 Defensively the Sabres seemed outmatched by the deeper, more talented Red Wings. Jhonas Enroth had a shaky outing, although he settled in during the second and third periods. It should be interesting to see if Ryan Miller does get the start in Nashville tonight. Joe Finley didn’t see too much ice – 7:51 to be exact. Pat Kaleta was the only Sabre to see fewer minutes and that was because the gritty winger re-aggravated his groin injury. Finley, touted as a strong skater, looked sluggish and a bit over his head. Obviously you can’t draw much from a single game, but Finley’s debut was less than impressive. Brayden McNabb is still playing good hockey. Two more hits and 18 minutes for the youngster. He seems to be coming around just fine. Enroth really started the year on a tear, he hasn’t been super human since taking over the starting role. While Ryan Miller wasn’t brilliant in the games before his injury, it will be good to get him back in net. Having a pair of reliable goalies will likely do wonders for the psyche of this team. Lindy Ruff will probably be shuffling his lines soon. Scoring one goal in three of their last four games is a serious problem, he needs to find a way to get his scorers going. Roy, Stafford and Vanek have been very quiet lately and that trend needs to stop. Zack Kassian wasn’t horrible. He was -1 again, but he has shown he is going to be a capable NHLer when he gets a permanent spot. All of these injuries will keep him up for the foreseeable future, but you can tell he hasn’t reached that extra gear just yet. . The Sabres have really hit the skids lately. They only seem capable of beating teams who are about to fire their head coach – save for the Blue Jackets – and can’t keep their lines together long enough to form any sort of chemistry. Meanwhile, the juggernaut that is the Detroit Red Wings comes to town sporting a six-game winning streak, a healthy roster and a generally tall task for the Sabres this evening. Buffalo is still struggling with injuries, Big Joe Finley will make his NHL debut this evening in place of Jordan Leopold. On the bright side, Ryan Miller is back in the lineup (he will backup tonight) as are Tyler Ennis and Pat Kaleta. I’m hoping Ennis remembers where he left his offense for the offseason, because he was fairly useless in the time before his ankle. I would imagine Ennis goes in for Matt Ellis and Kaleta replaces either Zack Kassian or potentially Ville Leino. Obviously much of this will be up in the air until game time. 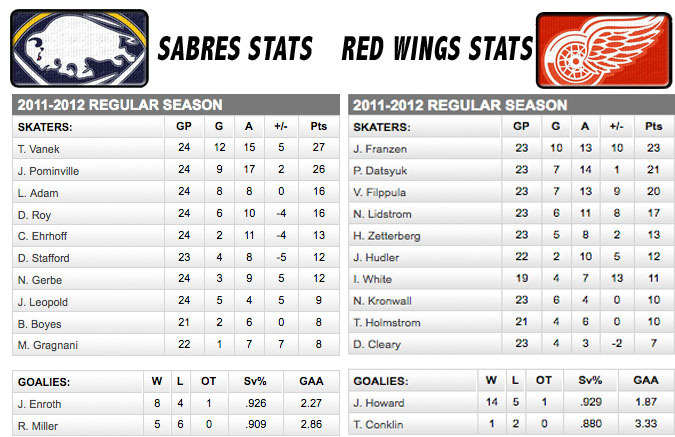 The bottom line for tonight is that the Sabres need a victory. They have been horrible at home and need to buck the trend. They face a difficult matchup as the Red Wings are healthy, talented and generally difficult to beat. Still, the Sabres need to get back into the left hand column and begin climbing back toward the top of the Eastern Conference. Joe Finley. The man who spawned a Twitter hashtag for the ages (see line above). I was high on Finley when he was drafted by the Caps. I became an even bigger fan when he blossomed for North Dakota leading up to 2009. Injuries derailed his development over the past two seasons and the Sabres very well may have stumbled onto a diamond in the rough with this guy. He certainly had the potential to be an effective NHL defenseman, injuries have just kept him from reaching that level.